FUKUOKA - Sometimes in life we meet a person we automatically connect with. It could be a classmate, teammate, co-worker, teacher or mentor. The communication and respect are there from the outset and blossom with time. When it spans countries and generations, it can become something truly beautiful. Such is the case for world bronze medalist Vincent Zhou and Mie Hamada — the young American skater and the veteran Japanese coach — who have a growing mutual admiration. Hamada looked after Zhou at the World Team Trophy last week while his coach remained behind in Colorado. Zhou put on quite a show in Kyushu, nearly outshining compatriot and world champion Nathan Chen. The 18-year-old Zhou finished second, just over two points behind Chen in the men’s event. So often over the years we have heard about Japanese skaters moving overseas to train and improve their skills with foreign coaches. This is why it was so refreshing to see Hamada behind the boards supporting Zhou at both the recent world championships and here. Japanese coaches have a lot to offer and deserve respect for teaching the fundamentals to many great skaters at a young age. In separate exclusive interviews with Ice Time, Zhou and Hamada talked about what makes their relationship work. I wondered if the language barrier was an obstacle for the two. “The technical terms are almost the same, so it’s easy to communicate about skating,” Hamada noted. I wanted to know what she felt Zhou must do to get to the next level. Zhou’s gratitude to Hamada clearly runs very deep. 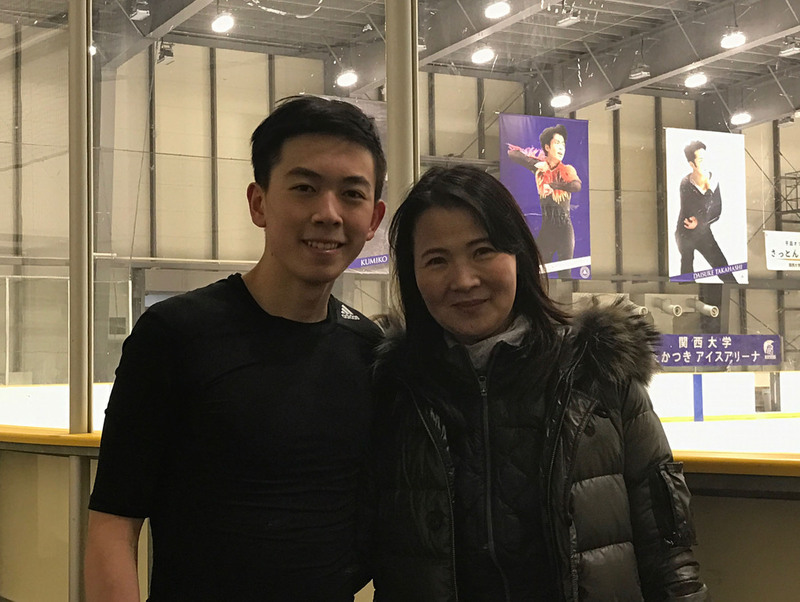 Zhou, the 2017 world junior champion, said practicing with Hamada yielded more than he expected. “Training with her has brought me much more than I anticipated,” Zhou stated. “She has really great knowledge of the fundamentals of skating. She studies other sports to see how to get rotation, how to get height, how to align the body correctly and she applies it to basic skating skills and uses the alignment that allows for good edges and applies to jumps. It’s stuff that you wouldn’t normally think of, but it instantly makes sense. Zhou, who is both eloquent and highly intelligent, cited how Hamada’s impact on him has been profound. Zhou, a native of San Jose, California, believes Hamada’s dedication is heartfelt and pure. Hamada detailed how Zhou integrated well with her team members. Hamada talked about her willingness to get feedback from Zhou. I wanted to know what Hamada thought about Zhou’s jumps. Hamada revealed to Ice Time that she has been asked in the past to coach foreign skaters full time in Japan but was unable to due to the restrictions placed on her by Kansai University, where the rink she teaches at is located. “If I have time (I would like to coach them), but I’m pretty busy,” Hamada commented. “Some American skaters asked me to teach already, but our rink is very strict. My rink is owned by the college, so it’s very hard. It’s not for everybody. Zhou thinks foreign skaters would benefit greatly from studying under Hamada. Ice Time queried Zhou about Miyahara, Kihira and Yuna Shiraiwa. “Their skating skills are so good. I see the exercises they do over and over again,” Zhou noted. “Those are the basic exercises that Hamada-sensei teaches them, and that’s how they learn the alignment they need for the jumps, from the skating skills. “A lot of people separate the two. They separate hard jumps and good skating. After discussing his collaboration with Hamada, Ice Time questioned Zhou about his performance at the World Team Trophy. “It was the cleanest program (his free skate) I have done in competition. It was the highest scoring program I’ve done in competition,” Zhou said. “It felt so good to put that out there at the end of my season, to improve upon my bronze-medal finish at worlds. To do even better than what I did there. Following his highly successful season I wondered what his goals for the next campaign would be. “My total score this competition was 299.01 points, so next season I want to get 300,” Zhou proclaimed. “I just want to continue integrating my quads in my skating. I think I have developed my artistry a lot in the last year and I want to continue doing that even more. Zhou looked back at how he has continually been able to raise the bar for himself. “My clean long (program) world record at junior worlds in 2017 was the peak of what I could do, but since then I have improved so much,” Zhou stated. Ice Time asked Zhou for his feelings about rivals Yuzuru Hanyu and Shoma Uno. “I grew up watching them compete. When I was a kid I was watching them compete at worlds and do really crazy stuff,” Zhou recalled. “I wanted to be at that level. I dreamed of one day competing with them. I thought that would be so cool. Zhou confessed that despite his rise in the past few years, he still has a way to go to be on the same level with Hanyu and Uno. After hearing his opinion on two of Japan’s stars of the present day, Ice Time inquired about what he thought of a star of the past — Daisuke Takahashi — returning to competition after a four-year retirement. “I heard about that and I thought he would still be a force to be reckoned with, if he did return,” Zhou said. “That’s impressive all in itself, to be away from competition for that long and still be considered a threat when he returned. Ice Time wanted to know if Zhou felt the combined success that he and Chen have had could lead to a resurgence in the interest in skating in the United States. “I hope so. My career can only last so long, his career can only last so long, any skater’s career can only last so long,” Zhou stated. “There would be nothing more rewarding in the future than to see a generation of young skaters inspired by us. “To pick up a pair of skates and try to make the Olympic team. The same way I watched Evan Lysacek win the Olympics and that motivated me.